Another great review from another client who appreciated the impartial nature of the invoice finance brokerage service that we offer. "Many thanks to Sean for all his help in setting up our invoice finance agreement. Going into the process, with very little understanding of the different types of invoice finance, I was dubious to go directly to finance companies who may attempt to sell me the product that is best for them, and not necessarily best for our business. 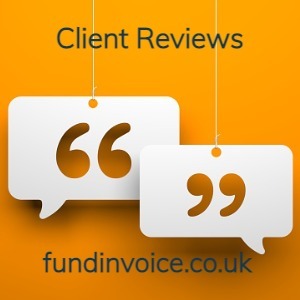 As FundInvoice are fully impartial I could utilise their expertise to get the best invoice finance agreement for our business. I am confident we have made the correct choice and I look forward to dealing with Sean, and FundInvoice, again in the future as our businesses finance needs change." Does your group or your Directors own any shares in any of the finance companies? Does your group provide any other services to any of the finance companies? If either answer is a "yes", its probably wise to understand exactly what the situation is so that you can decide if they are likely to have any kind of bias. We pride ourselves on not having any bias, enabling us to give completely independent advice to our customers. It is also worth checking that the brokerage deals with a good cross section of factoring companies. If they only deal with one or two, as many firms of accountants told us they did in a survey we conducted, you might not be getting the best access to the marketplace that you could.